Yes, five years have passed since the last set of Dietary Guidelines for Americans was released. 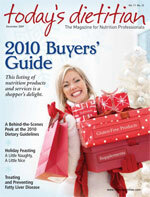 Today’s Dietitian goes behind the scenes to reveal what’s going on with 2010’s version. 2010 is set to be a big year. It marks not only the beginning of a new decade but also the launch of major public campaigns—from the initiation of the International Year of Biodiversity to the Healthy People 2010 initiative. And don’t forget that 2010 also marks the release of the next set of Dietary Guidelines for Americans. Not a big deal? Let’s put it into perspective: The Dietary Guidelines reflect the distillation of the latest body of nutrition science into nutritional goals that promote health and reduce the risk of chronic disease. The guidelines are the foundation for federal nutrition policy and nutrition education across the land. “Since 1894, the Department of Agriculture has developed and issued food guidance for the American public. In this long evolution of providing the most up-to-date dietary guidance, the Dietary Guidelines for Americans have become recognized as the nation’s cornerstone of federal food policy. The Dietary Guidelines are of particular importance to nutrition education of the general public and in strengthening the nation’s food assistance programs, which include SNAP (Supplemental Nutrition Assistance Program formerly known as the Food Stamp Program) and the School Lunch and WIC Programs,” said USDA Secretary Ed Schafer in an October 2008 press release. The Dietary Guidelines are of particular value to nutrition professionals involved with educating people. Elisa Zied, MS, RD, CDN, a spokesperson for the American Dietetic Association (ADA) and the author of Nutrition at Your Fingertips, believes the Dietary Guidelines provide a wonderful foundation for helping people understand how to eat. “They’re based on scientific evidence and translate findings from research on food, nutrients, and other substances and components of foods, dietary patterns, and fitness into practical and useful information,” she says. In anticipation of 2010’s impending version of the Dietary Guidelines, let’s take a look at the guidelines development process, its history, and its past and current controversies and discuss the importance of educating the public using these latest science-based recommendations. So how did the whole idea for the Dietary Guidelines come about? In 1977, after many years of discussion about nutrition science, the Senate Select Committee on Nutrition and Human Needs, led by Sen George McGovern, recommended the first formal set of guidelines, titled Dietary Goals for the United States. At the time, the goals for Americans included increasing carbohydrate intake to between 55% and 60% of calories, decreasing dietary fat intake to no more than 30% of calories, decreasing cholesterol intake to 300 mg/day, decreasing sugar intake to 15% of calories, and decreasing salt intake to 3 g/day. The Dietary Goals received a great deal of backlash from both industry and science, which argued that research did not adequately back the specificity of numbers listed in the goals. In response, the Department of Agriculture and the Department of Health, Education, and Welfare gathered scientists to assemble a February 1980 brochure called the Dietary Guidelines for Americans, representing their views on a healthful diet and lifestyle. Though these suggestions were fairly straightforward interpretations of the latest science, they met with a fair share of controversy from the industry, as well as the scientific community. This controversy led to the development of the Dietary Guidelines Advisory Committee (DGAC), which aimed to capture the debate from industry and science during the creation of the next set of Dietary Guidelines in 1985. In 1990, with the passage of Public Law 101-445, Congress directed the two departments to issue the guidelines every five years. The DGAC has since assisted in preparing each version of the Dietary Guidelines for Americans. While the guidelines have been very consistent over the years, they have also picked up on some notable changes based on emerging science. The guidelines have come to be known as the go-to document for public nutrition guidance. Many developed countries have established their own set of government-issued dietary guidelines based on nutrition goals specific to their population. In 2008, as the due date for the next set of Dietary Guidelines approached, the USDA and HHS secretaries announced the appointment of 13 nationally recognized experts with experience in dietary intake, human metabolism, behavioral change, and health to the 2010 DGAC. The DGAC then began the process of reviewing the scientific literature and holding scheduled meetings to advise the secretaries of any necessary revisions for the next set of guidelines. The DGAC meetings include presentations by experts, such as Harvard Medical School professor Frank Sacks, MD, and discussions on pertinent topics—from alcohol intake to energy balance. The April DGAC meeting was the first ever to be streamed live via a Webinar format, allowing Americans to hear the deliberations and see the presentations. (The Webinar is currently available in archived form online.) Robert Post, PhD, MEd, MSc, acting executive director of the USDA Center for Nutrition Policy and Promotion (home of the Dietary Guidelines), reports that this format ties into the current administration’s commitment to keeping the process open and transparent. Anyone can view information related to the DGAC, including information on the members, meeting presentations, and meeting minutes. Continuing the transparency in which the guidelines are established is the public comments process. Anyone—from individuals to organizations—can make written public comments to the DGAC for consideration throughout the course of revision. Comments run the gamut—from a simple request for the committee to consider the benefits of plant-based nutrition posted by a practicing RD to a complex evidence-based review request from the Physicians Committee for Responsible Medicine. Consumers and professionals can view the comments, as well as other DGAC information, by visiting the Dietary Guidelines for Americans Web site at www.cnpp.usda.gov/DietaryGuidelines.htm. The fifth DGAC meeting will take place in the winter of 2009-2010. In the spring of 2010, the DGAC is scheduled to issue its report (which will be made available for public comment) to the secretaries of the USDA and HHS. In the summer, the USDA and HHS will prepare the Dietary Guidelines Policy Document. Next fall, the seventh edition of the Dietary Guidelines for Americans will be set for publication. What is the ADA’s involvement in the establishment of the country’s most important nutrition policy? The association recommends individuals to serve on the DGAC, according to Jessie Pavlinac, MS, RD, CSR, the ADA’s president. “If we’re going to set the Dietary Guidelines, who better to serve on the advisory committee than members of an organization of 70,000 food and nutrition experts? These individuals on the committee have a strong expertise in science and are in touch with the real world,” she says. The current DGAC includes five ADA members and three RDs. Linda Van Horn, PhD, RD, editor of the Journal of the American Dietetic Association, currently serves as its chair. The ADA also contributes to the guidelines in other ways. Its Evidence Analysis Library is very similar to the USDA Evidence Library, explains Pavlinac. The ADA provides training in evidence analysis to USDA staff and also assists with about 200 scientific analyses for the DGAC. And following its history of making public comments during the guidelines revision process, the association has made written public comments for the 2010 version. Two major areas concern the ADA. First, the association believes that the revision schedule for the Dietary Guidelines should extend from five to 10 years. “If we gave them 10 years, we would have a chance to strengthen our research base. We could determine how the eating pattern has changed according to the Dietary Guidelines. We could look at data on the effect of the Dietary Guidelines on medical risk. We would have longer to educate people on the consumer piece, such as MyPyramid, that goes along with the Dietary Guidelines. It’s very important to evaluate how effective the Dietary Guidelines are, and we need longer than five years to do that,” says Pavlinac. Secondly, the ADA would like more focus on food-based recommendations and eating patterns over supplements and nutrients. “We don’t eat nutrients; we eat foods. We don’t eat single foods; we eat patterns of foods,” stresses Pavlinac. If the Dietary Guidelines were born in an atmosphere of controversy, you might say that little has changed over the years. The 2005 Dietary Guidelines have received their share of criticism, including accusations of overinvolvement and unethical weigh-in by the food industry and the integration of weak science. The Internet is home to more than a few bloggers railing against the guidelines and how ineffective and inaccurate they are—sentiments shared by some nutrition experts. A 2008 American Journal of Preventive Medicine article called for a higher standard in setting the Dietary Guidelines. The authors argued that the guidelines are generally based on weak evidence and that there is a misconception that they can cause no harm. Using the guidelines’ recommendation against dietary fat as an example of public harm, the article chronicled how the low-fat phenomenon contributed to today’s obesity epidemic. The Dietary Guidelines aimed at the U.S. population have traditionally been issued without prespecified and transparent support of evidence for disease outcomes across all population groups, said the authors, and such guidelines could have unanticipated and adverse effects. To avoid this possibility in the future, specific and transparent classification of the quality of the evidence should be included in guideline development. Sometimes, in the absence of clear and convincing evidence of net benefit, it means that guidelines should not be issued at all, the article concluded. In response to the article, Steven H. Woolf, MD, MPH, and Marion Nestle, PhD, MPH, wrote a commentary in the same journal issue. Woolf and Nestle reported in their commentary that it has been evident for decades that experts are concerned about scientific evidence in developing dietary guidelines. There is evidence regarding the potential harms of dietary modifications, dietary guidelines, and practice guidelines in general. The food industry—along with its lobbyists—has exerted pressure to eliminate or soften language in the Dietary Guidelines that may harm commercial interests. Nutrition research has unique limitations, as it is difficult to determine which food constituents may be responsible for positive outcomes, and nutrition flip-flops (dietary strategies thought to be helpful but found to be the opposite, such as in the case of beta-carotene) have occurred. But the authors concluded that, although the Dietary Guidelines can be improved, they are not the culprit in the obesity epidemic. The larger concerns are poverty and an environment that promotes overeating and inactivity. To scapegoat the Dietary Guidelines is to oversimplify the complex and confuse the necessary task of confronting these larger determinants of obesity, according to Woolf and Nestle. Conflict of interest has also become an issue. A Center for Science in the Public Interest analysis revealed that about one half of the DGAC’s 13 members have taken funding from the food and pharmaceutical industries that was not disclosed by the government. Today’s Dietitian contacted the USDA Center for Nutrition Policy and Promotion, which declined to comment about the Center for Science in the Public Interest’s statement. Under the rules of the Federal Advisory Committee Act, the DGAC is prohibited from having contact with the press until it has completed its work and submitted its report to the secretaries of the USDA and HHS. However, the Center for Nutrition Policy and Promotion has strategies in place to take into account any bias that may creep into the DGAC as it formulates the guidelines. The development of the Dietary Guidelines is a transparent process that is open for anyone to view, and all nutrition evidence is now managed through the USDA Nutrition Evidence Library, launched in July 2008. The library evaluates, synthesizes, and grades research using rigorous and transparent methodology to support the DGAC’s scientific review process. Do the Dietary Guidelines Work? It’s a good question and one that has troubled some USDA researchers. “Nobody has ever tested the Dietary Guidelines for anything. It’s really appalling. We are recommending to the public how to eat, but it is not tested. We have studied components like what a high-fiber diet can do but not the entire diet together and what it does. I’ve not been able to find any country that has studied how effective their government nutrition policies are,” says David Klurfeld, PhD, national program leader of human nutrition at the USDA Agricultural Research Service. Klurfeld reports that the Agricultural Research Service had proposed two studies to look at the efficacy of the Dietary Guidelines. The first, which has already started, is a survey of children and caregivers. The second proposed trial is a feeding study of 800 people following the Dietary Guidelines. “The feeding study was never funded by Congress. It is a very expensive study,” notes Klurfeld, adding that controlling costs is a real focus now for Congress, although President Obama is clearly interested in disease prevention. According to Klurfeld, through an extrapolation of data on the consumption of foods, the maintenance of body weight, and physical activity, scientists estimate that only 3% of the population follows the Dietary Guidelines. “We are now studying what motivates and inhibits people to follow the Dietary Guidelines, which is very important,” he says. “Such a small percentage of people are influenced about what to eat by the Dietary Guidelines. We need to look at the barriers. I believe that the biggest issue is educating people so that they understand how to fit them into their lives. You may think that MyPyramid is easy to use, but consumers don’t find it as easy as we think it is. Nutrition education is being whittled away in schools, so we need to teach people about the Dietary Guidelines,” says Pavlinac. And what about making room for the health of the environment in the Dietary Guidelines? That’s exactly what Sweden is doing. According to Ulf Bohman, head of the nutrition department at the Swedish National Food Administration, Sweden is the first country to create food guidelines giving equal weight to climate and health. Some of the proposed new dietary guidelines make recommendations such as favoring carrots over cucumbers and tomatoes because the latter vegetables are grown in heated greenhouses.